Why would I need self storage in Jacksonville, FL? How much is a storage unit in Jacksonville, FL? The cheapest storage unit in Jacksonville, FL is $25.00 per month. What size storage units do you have available in Jacksonville, FL? In Jacksonville, FL we have sizes that range from 5'x5' to 25'x60' to suit your storage needs. How much is it for a 5'x5' storage unit in Jacksonville, FL? The cheapest 5'x5' storage unit in Jacksonville, FL is $25.00 per month. Jacksonville is Florida's most populous city and the nation's largest city by geographical area, spanning close to 900 square miles. It sits on the banks of the St. Johns River, only about 25 miles south of the Florida-Georgia line. This massive city has plenty to offer, ranging from beaches and lush parks to shopping, dining and nightlife. Historically, the Timucuan Indians first settled in the area around 500 B.C. About 1562, the French Huguenots made it the first European city along the St. Johns River, establishing Fort Caroline along the bank. It stood for a mere three years, then the Spanish took over and demolished the fort, replacing it with their own Fort San Mateo. Some 200 years later, the Spanish transferred the land to British control for 20 years. Then as fate had it, it returned to the Spanish in 1763. At that time, plantations covered the land and indigo, lumber, vegetables, rice and cotton were staples ready to export. In 1822, the area became a US territory and was named for Andrew Jackson, the first provisional governor of the district and future U.S. president. After the Civil War, Jacksonville was a popular resort town for America's elite, providing easy access to its sunny beaches via railroad and steamboat. In 1901, the city suffered a massive fire that destroyed thousands of buildings and left more than 10,000 people without homes. The "Great Fire of 1901" began as a small kitchen fire, but remains one of the worst disasters in Florida's history. The city set about rebuilding and received an economic boost when it earned attention as a favorite for New York City-based filmmakers. The mid-1900s were filled with challenges for the city, as it battled urban sprawl, corruption and a declining population. However, things began to turn around in the late 1960s, when voters elected to pass a consolidation referendum that joined city and county governments. Since then, Jacksonville has undergone major revitalization efforts, including economic development, environmental protection measures and road improvements. 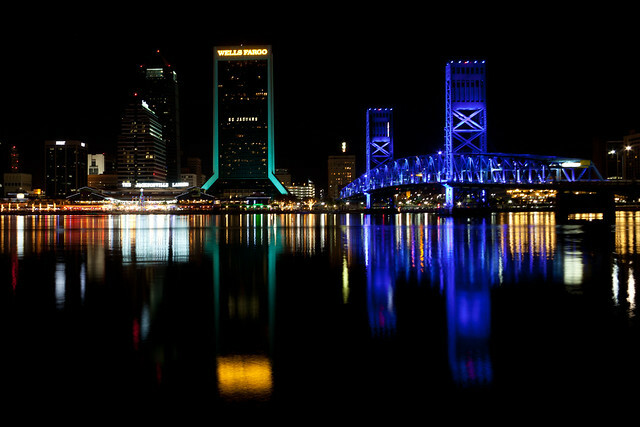 Jacksonville is home to a vibrant arts and culture scene along the St. Johns River in downtown, as well as a number of large corporations and businesses. The city is known as a dynamic area for new and expanding businesses, thanks to its intermodal transportation system consisting of seaports, airports and railways. This system makes it a convenient place for domestic and international commerce. The largest employer in Jacksonville is Bank of America, followed closely by other large corporations like Merrill Lynch, Florida Blue, Citibank and the Mayo Clinic. The city's status as an important military hub results in thousands of civil service jobs, and its convenience has attracted a number of logistics companies as well. You can also find jobs in ship repair and maintenance, transportation and freight-handling. As a resident of Jacksonville, you'll have access to more than 20 miles of pristine, uncrowded beaches, ideal for enjoying the warm, sunny climate. The city zoo and botanical gardens are also popular attractions, or you can attend a game hosted by the NFL's Jacksonville Jaguars. Jacksonville is host to a number of music festivals, carnivals and special events, with plenty of family-friendly activities to choose from. Duval County Public Schools operates the public schools in Jacksonville, including several charter schools and magnet campuses in addition to traditional elementary, middle and high schools. Several of the city's schools are regularly recognized for academic achievement. You'll also have the option of a variety of private school campuses, including several schools managed by the Roman Catholic Diocese of St. Augustine. If you're considering pursuing your degree in Jacksonville, you'll find plenty of campuses to choose from. The University of North Florida, Jacksonville University and Florida State College are just a few of the institutions of higher education in the area. Utilities: JEA and People's Gas provide the major utilities in Jacksonville. Garbage and Recycling: Your trash, recyclables and yard waste will generally be collected on separate days, with your home's location determining the pick-up schedule. Transportation: The Jacksonville Transit Authority operates a network of public transportation options, including several bus routes throughout the city. Because of Jacksonville's massive size, it's home to a large and active housing market. You can find a number of options to fit nearly any budget, preference and style, ranging from compact rental apartments to spacious single-family homes. The median home price in Jacksonville tends to hover slightly lower than the national average, which is good news if you're hoping to find a quality home for a good price. Our lowest priced units in Jacksonville, FL average $47.38 per month. 926 people have reserved units in Jacksonville, FL in the past 30 days. There are 13 locations within Jacksonville, FL's city limits. There are 7 locations in Jacksonville, FL that offer AC and Heating features.